One of the most significant flood protection measures in Manitoba is the Red River Floodway, which protects the City of Winnipeg. Starting in 2005, Canada and Manitoba invested $665 million to further expand the Red River Floodway. The original floodway was built between 1962 and 1968 and cost $63 million. At the time, excavation of the floodway channel was the second largest earth moving project in the world (second only to the Panama Canal and larger than the Suez Canal project). Since 1968, it has prevented more than $40 billion (in 2011 dollars) in flood damage in Winnipeg. It is often referred to as Duff's Ditch in recognition of then-Premier Duff Roblin, who spearheaded the development of the floodway. The expansion of the current floodway system (including the West Dike and channel outlet) began after the 1997 flood, to protect the City of Winnipeg from a one-in-700-year flood. 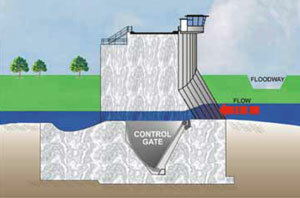 It increased the floodway's capacity - from 90,000 cfs (cubic feet per second) to 140,000 cfs. The floodway operates by diverting a portion of the Red River flow around Winnipeg through the floodway channel. During flooding, as the river naturally rises, it spills over the floodway channel entrance and flows down the floodway channel. When this happens, the river water flows through two routes - through the city and through the floodway. At the same time, it drops below its natural level, south of the floodway inlet. 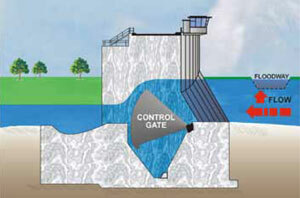 When the floodway gates are raised, the water level south of the floodway inlet is restored to its natural level which, in turn, allows more water to spill into the floodway. As Red River flows continue to increase, the level south of the inlet drops below natural again and the gates are raised further. This process continues as long as the flow in the Red River continues to increase. During the majority of floods, the floodway is operated to ensure that the water level south of the city is maintained at the natural level - that is the level that would occur if the flood control works did not exist. In a major flood, even larger than 1997, the flow through the city will be controlled with the guidance of three spring floodway operating rules. These rules are designed to ensure Winnipeg's primary diking system is not overwhelmed. When these rules are implemented to protect the city, there may be instances when additional water going through the floodway causes artificial flooding of land and roads south of the floodway inlet. In recognition of this possibility, the Manitoba government has legislation in place which provides compensation to individuals impacted by this artificial flooding. A fourth floodway operating rule is also in place, but is only applied during the summer when high water levels affect Winnipeg's storm sewer and combined sewer systems. The combination of high water and a high intensity rain storm can overwhelm the sewer systems causing basement flooding. If this occurs, operation of the floodway can lower water levels in the city, reducing the damages and potential health risk caused by basement flooding. The floodway is recognized as a National Historic Civil Engineering Site and is considered one of the world's 16 engineering marvels. For more information, see www.floodwayauthority.mb.ca.